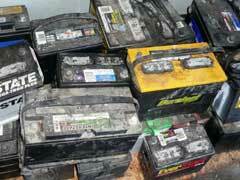 Used Car Batteries Recycling - How Old Battery Can Earn You Some Cash? One of the most important steps you’ll take when replacing your battery is recycling your old one. What many people don’t know is that there are shops that will buy your used car batteries and pay you well for them. The key is to find ones in your area that will pay you for your used car batteries. There are many scrap yards that pay for items like used car batteries. By looking in your Yellow Pages, doing a search on Google or asking a dealer you can locate scrap yards in your area. It’s a good idea to contact them before stopping by that way you receive an idea of what parts they are looking for and what they are paying for parts like a used Bosch car battery. Along with scrap yards, there are others out there interested in used car batteries. If you come across a foundry or private buyer make sure to learn as much as you can about them and comparison shop by contacting a scrap yard to make sure you are receiving a good deal. When you decide to transport the old battery, it’s important to take safety precautions. Before lifting it you’ll want to inspect the part for any cracks where acid can seep out. If there are cracks you will want to avoid touching the area altogether. Additionally, it’s important to keep in mind that batteries are heavy so be sure to lift with your legs, not your back as this will prevent you from sustaining an injury. By doing research ahead of time you can find dealers and scrap yards in your area that will pay you for your used best car batteries. This can help you recoup some of the money you’ll pay for replacing it.